This holiday home is situated in a simply stunning location! Watch the waves roll in, and enjoy the spectacular views up and down the beach and over to Mayor Island. 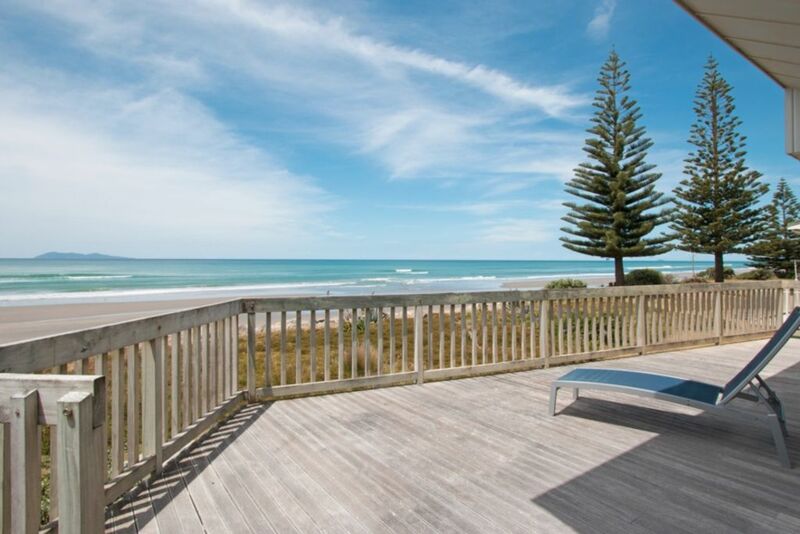 Direct and very easy access to the beach from the front lawn means no excuse not to take that early morning swim or invigorating walk along the sand. The open plan upstairs living flows out on to a generous deck area, perfect for sundowners while the kids play in the sizeable rumpus room, or eat at the picnic table on the lawn below (where you can keep an eye on them from the deck). It is an easy 10-minute walk to the village so no need to drive if you want to dine at one of the many delightful Waihi Beach cafes. The house is on two levels. Upstairs has open plan kitchen, dining area and lounge flowing out onto the large deck. One double bedroom, one single, a bathroom and separate toilet are also on this level. Downstairs are a further two double bedrooms, rumpus room (with additional TV) and a bathroom and separate toilet. There is also an outdoor toilet and shower (which you access via the external door from the rumpus room to the outside area), perfect when coming off the beach! There is access to both the entry driveway and the front lawn/beach from this level. To accommodate extra people, the rumpus room downstairs has ample room to put up two queen size airbeds. The house is very well equipped with everything you need for a perfect holiday. The kitchen includes a microwave, dishwasher and all the usual things you would expect. There is an assortment of books and games for rainy days and a few boogie boards. Linen is supplied so no need to drag that along from home. Just bring your swimmers and you will be set. This is a lovely, comfortable house which is as close to the water as you can get. After all, what is the point of having a beach holiday if you aren't actually ON the beach? Pets are considered, so feel free to ask. Each booking requires a damage deposit. This is $200 and will be refunded after the stay provided all is in order. Rates negotiable for longer term bookings during off peak season. Rubbish collection is Monday mornings (green council bags can be bought at the local Four Square). If you leave before or after rubbish collection, please take your rubbish with you. Plenty of plates, glasses and mugs. Pretty much everything you need. There are two TVs. One upstairs and one downstairs. Might be best to bring your own HDMI cable as mine keeps disappearing! Plus some DVDs. Great even in the wet! The weather was atrocious but the bach was wonderful. A prime location right on the water and fully stocked with everything you could possibly want. What a wonderful place to stay on the beach. The house has everything you need from a coffee machine to nice wine glasses and it was great to have a dishwasher too. The position is so good beach right there, but an easy stroll to the main shops too. Absolutely perfect place to rent over summer. Also being dog friendly was so nice to have the whole family on holiday. So glad you enjoyed your stay Shannon. I agree that good wine glasses are absolutely essential! Thanks so much for your lovely comment. Hope you stay again! Location is amazing, right on the beachfront. Sadly the property was not clean and lacked general repairs and upkeep. It is old and bachy and needed a good spring clean and new linen and had ongoing issue with hot water in the kitchen. Hopefully with the latter taken care off, you can enjoy the space and fabulous setting so close to the sea. Thanks for the Headsupp about the cleaner Laurelle. I have a new cleaner now and the house is super clean.... This house is a typical kiwi bach and while it is not flash, it is right on the beach. The location was absolutely incredible, the views from the lounge and deck are simply beautiful. The house is well equipped with everything you need. Fantastic house on beach with everything you could possibly need for a beach holiday! Fantastic house on beach with everything you could possibly need for a beach holiday! We will be back..such a great spot!